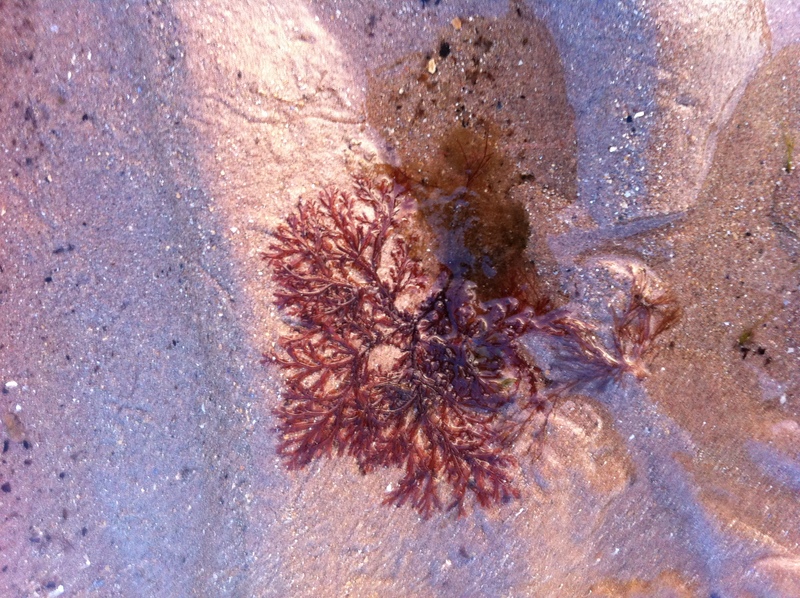 The red algae are amongst the most beautiful seaweeds found along the shores of our islands. For the most part they lie quietly hidden deep in the tangles and folds of kelp stalks or nestled in the far tide pools of the midlittoral zone. They vary enormously from the silky elastic fronds of the Palmaria palmata to the feathery Delessaria sanguinea and the porcelain-like tufts of the Corallina officinalis. 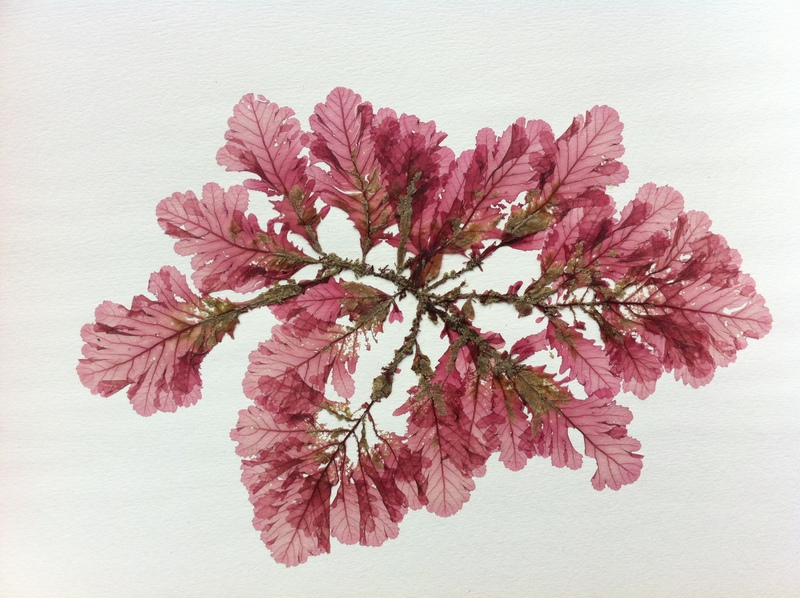 Red algae forms are as various as their colours, with some hard, limy and crustose (the calcareous ones), to those with long, wavy, single, or split blades, or cylindrical forms to those of threadlike lacework. Even the tiny epiphytic Polysiphonias have hundreds of delicate filamentous branches creating an almost spherical, starry mass. 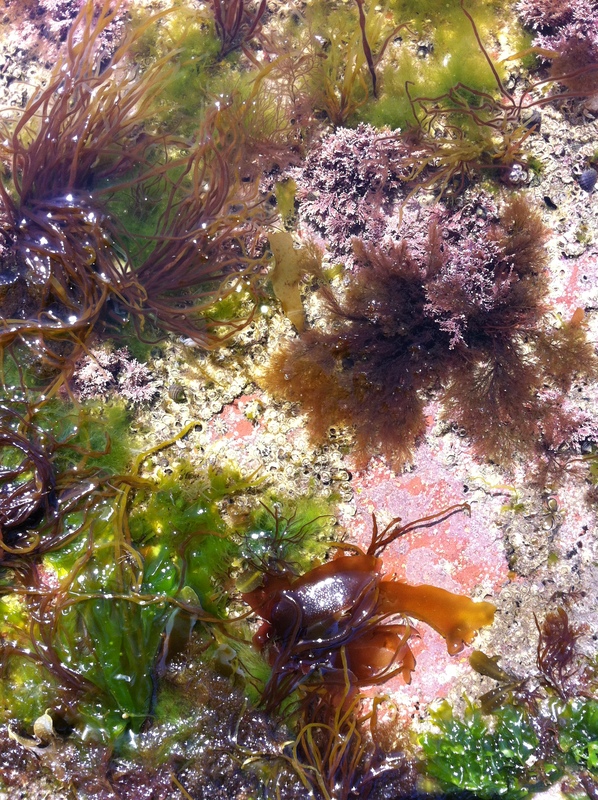 Some Rhodophyta have been harvested as a regular foodstuff for centuries, most commonly Palmaria palmata (Dulse), Chrondus Crispus (Carrageen or Irish Moss) and Porphyra umbilicalus (known as Laver here, Nori in Japan) – not surprising as all are high in both vitamins and protein. These and others, specifically the agars and carrageenans, which contain long chain polysaccharides, are also used in as gelling and thickening agents in commercial food production (yogurts, puddings, chocolate milk, etc). The inedible Coralline alga contribute to the food chain in another way, being equally responsible for building and maintenance of the substructure of tropical reefs as coral, which creates a habitat for a multiplicity of marine organisms. By secreting calcium carbonate, magnesium carbonate or strontium carbonate onto the surface of their cell walls, they build up a brittle body mass; with some mimicking a leaf-like form of articulated branches, and others using the strength of the calcium to secure themselves to rocks and reefs. It is this strength that helps them to absorb wave energy and gives shelter to other seaweeds and tiny organisms sharing the reef. These calcareous corallines have however ingested by humans for other purposes, serving from ancient times as a vermifuges (anti-worms). 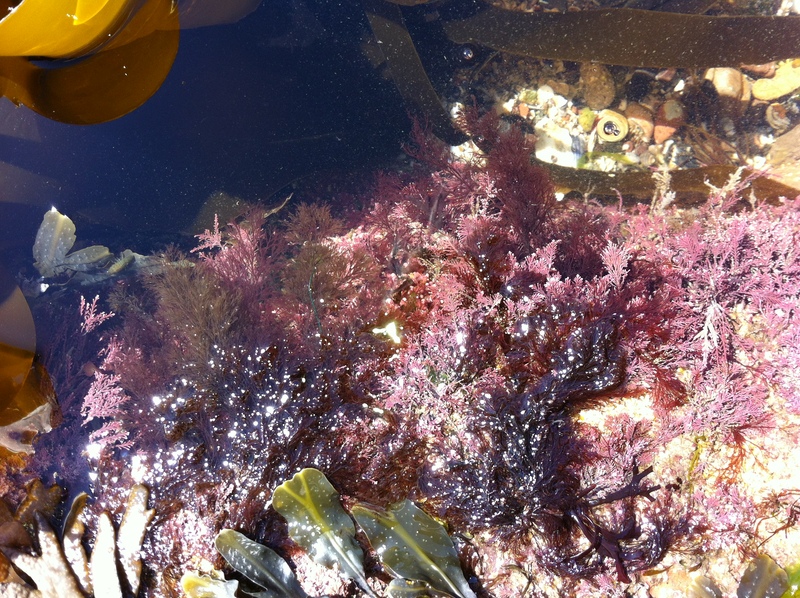 More recently some Rhodophyta have been used in cosmetic and therapeutic products, from products which use extracted marine acids (AHAs), incorporating them into skin exfoliants, whilst others combine calcareous reds with kelps to detoxify and cleanse the system and restore essential minerals and salts.